Please note that the shop is currently under reconstruction. Colour: #2 -4, dark brown with a hint of auburn. The wig was dyed this colour and dyeing it a lighter colour would require first lifting its current colour. Cap Size: approximately 22 inches - medium (adjustable straps to make it smaller). Hmmm… “What size is my head?” We hear you ask. Go peruse our LW (lace wig) measurements guide for help. 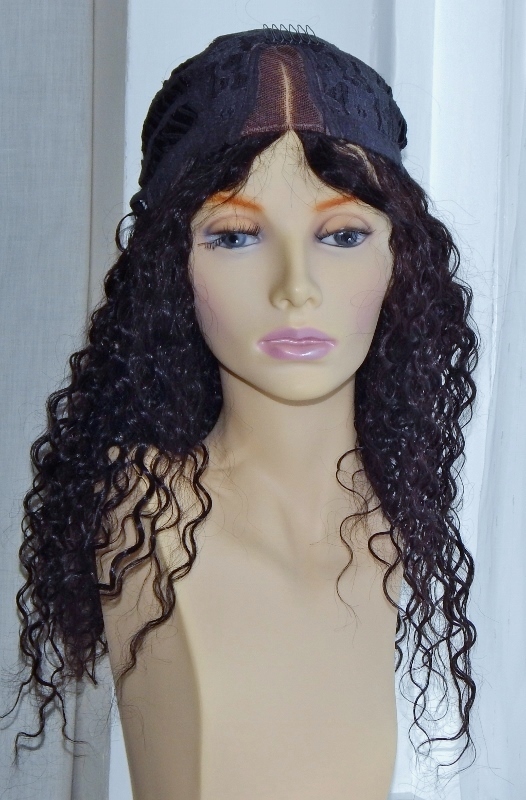 Cap Construction: Full cap wig with a small V-shaped lace section at the front with a created middle parting. No adhesive required, wefts throughout – wefts are open (no solid integral cap – see images); four combs (front at the top, sides and back); adjustable straps; The V-lace section is medium to light brown in colour, as it's just the parting a concealer can be used to make the parting darker or lighter. The knots are unbleached (this reduces shedding and can be covered using concealer or foundation), fine hairs (baby hairs) at the front. 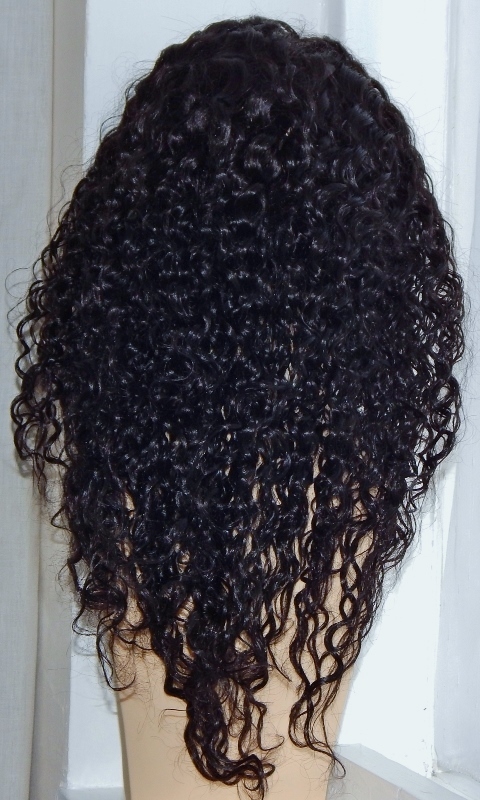 The small loose curl texture is a great look for lace front human hair wigs. If you're looking for something that is lies between a curl and a deep wave then this is it and keeps its texture after washing. As it's made of Remy human hair, it can be heat styled, so straighteners at the ready! Just wash for the texture to return. The cap construction of these V-lace front wigs means they’re adaptable. If you’ve got growth hair (full or partial) you can wear it and if you’ve lost all of your hair you can wear it – so a great choice all round. 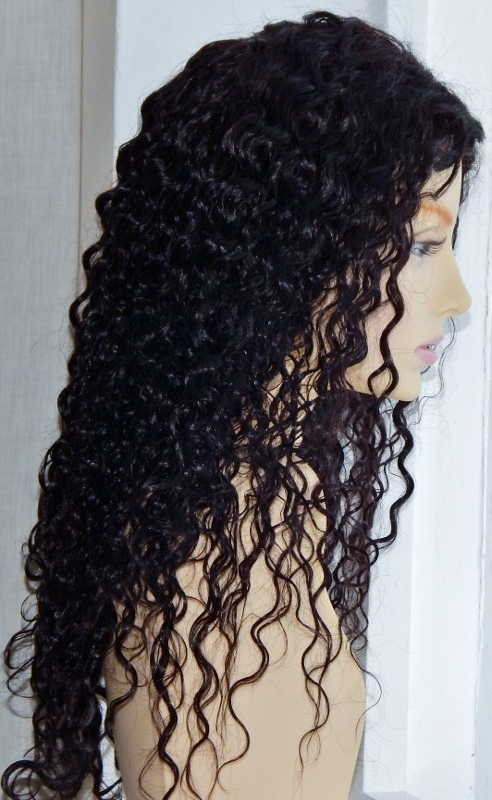 The length and texture of this lace wig means that it's great for oval, square, heart, oblong and round shaped faces. 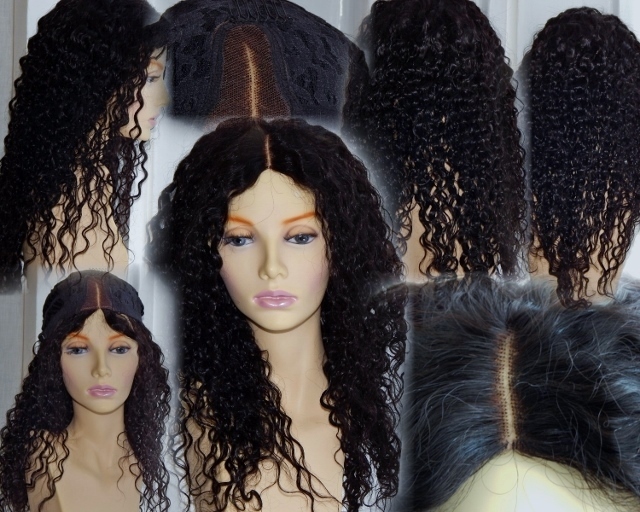 Cap Construction: This lace front wig can only be worn as a "glueless" lace front wig as there is only a small section of lace at the front of the wig. It's better described as a full lace cap wig with a small V-shaped lace section at the front with a created middle parting. The V-lace section is medium to light brown in colour with a predefined parting. Lace Measurement: the lace section measures three inches deep, two inches wide, narrowing to one inch towards the crown – see image above. The above images show how natural the parting looks. A close up of the inside of the lace front human hair wig shows the small V-shaped lace section at the front with a created middle parting. No adhesive required for this wig. Hair has deliberately been ventilated at the sides through the tabs. The parting on this wig cannot be changed. There may be some lighter strands of hair – these can be removed and are perfectly normal and are a product of the dyeing process.